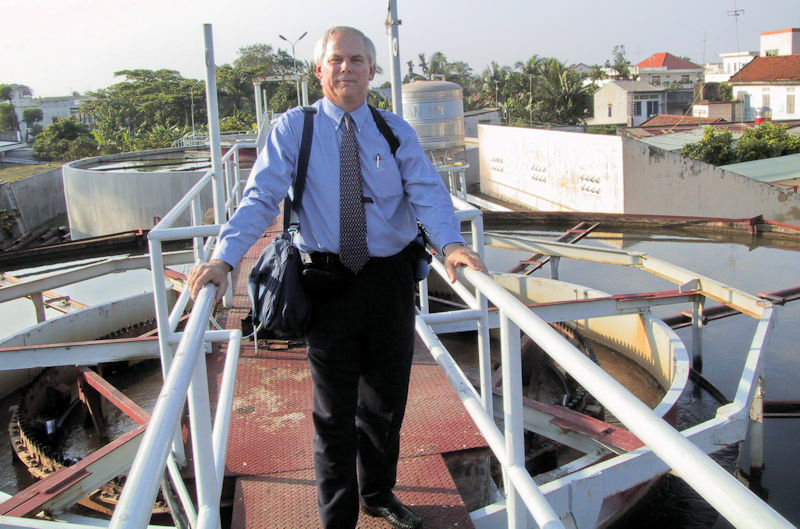 Al Goodman tours the wastewater treatment system at a water resource recovery facility in Hanoi, Vietnam. Photo courtesy of Goodman. Al Goodman got an early introduction to water. By working with his father, who owned a plumbing business, he learned about the residential and commercial aspects of the water sector as well as the skills needed to run a company. This set Goodman on a path toward water sector leadership that earned him a place among the 2017 Water Environment Federation (WEF; Alexandria, Va.) Fellows. This distinction recognizes his professional achievements and contributions to practice areas served by WEF. Goodman earned a bachelor’s degree in chemistry from Bellarmine University (Louisville, Ky.) in 1971. He got a job running the laboratory at a 15-ML/d (4-mgd) water resource recovery facility (WRRF). But 3 days after starting, the mayor fired the WRRF’s superintendent and asked Goodman if he wanted the job. In 1990, Goodman (top photo, left) presented the trophy to that year’s first-place Operations Challenge team, Ches-Eliz Lightning, from the Virginia Water Environment Association. 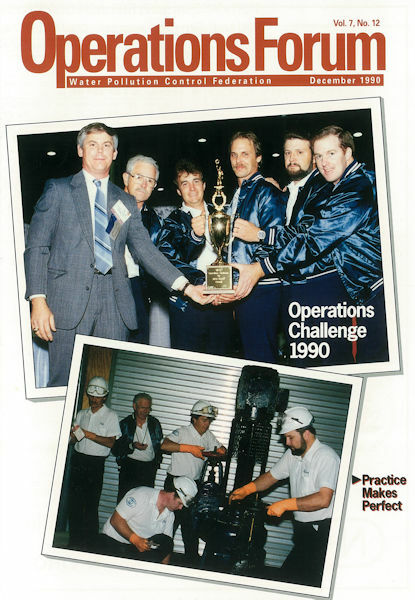 Click to see Operations Challenge coverage in the December 1990 issue of Operations Forum. “I took every training course I could,” Goodman said. “[I] went to my first WEFTEC® in 1975.” He hasn’t missed one since, he said. Goodman joined WEF and the Indiana Water Environment Association (WEA) in 1975, and his involvement in both has grown exponentially throughout the years. “I was hooked in 1975 on WEF,” Goodman said. Goodman was named a 2017 Water Environment Federation (WEF; Alexandria, Va.) Fellow for his leadership and contributions to both WEF and the Indiana Water Environment Association. Photo courtesy of Goodman. Goodman’s WEF leadership culminated in terms as vice president (1997–1998), president-elect (1998–1999), and president (1999–2000). He received the WEF W. Wesley Eckenfelder Industrial Water Quality Lifetime Achievement Award in 2017. He also has received an Operations Challenge Outstanding Service Award in 1997 and several service awards throughout the years from WEF. 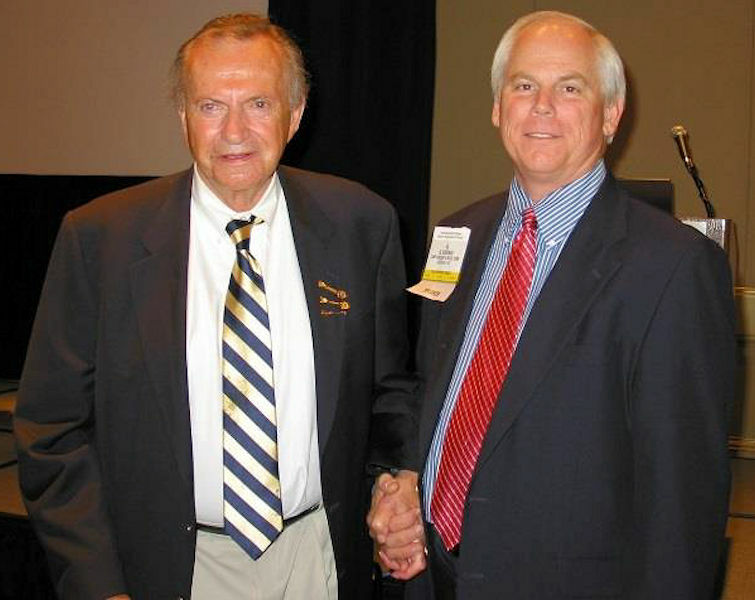 At Indiana WEA, Goodman served as president from 1988 to 1989 and as chair on eight different committees. He represented Indiana WEA on what is now known as WEF’s House of Delegates from 1993 to 1996. Indiana WEA presented Goodman with the Honorary Membership Award in 1998; Twenty-Year Club Award in 1994; the Arthur Sidney Bedell Award in 1991; the Indiana Industrial Waste Award in 1987; and the Tumblebug Service Award in 1983. 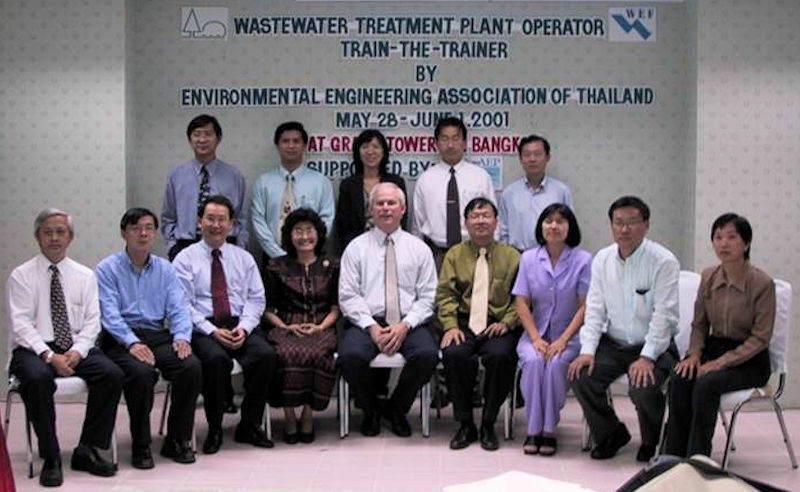 In 2001, Goodman (front row, center) traveled to Bangkok to help provide training for wastewater treatment operators during a workshop organized by the Environmental Engineering Association of Thailand (Bangkok). Photo courtesy of Goodman. Goodman has also been a leader in other water organizations and earned recognition for his service. He served on the Water Environment Research Foundation, now The Water Research Foundation (Denver), board of directors from 1997 to 1998; as director of the Kentuckiana Chapter of Hazardous Materials Managers from 1996 to 1998; as president of the Indiana Society of Professional Engineers (Indianapolis) in 1984 and from 1990 to 1993; and as president of the Southern Indiana Wastewater Plant Operators Association in 1981. 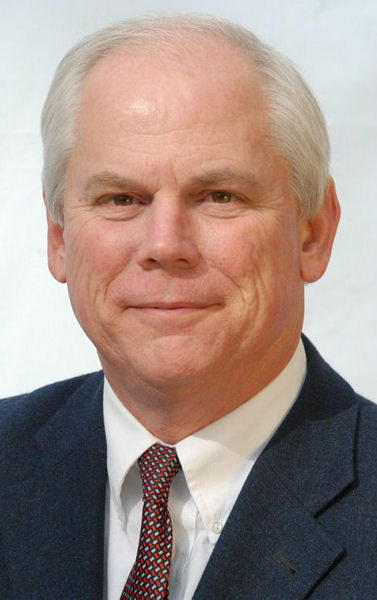 He was recognized as the Southern Indiana Operator Association Professional of the Year in 1998 and received the Indiana Industrial Operators Association Environmental Stewardship Award in 2014. From right, water sector leaders Goodman and W. Wesley Eckenfelder Jr. participate in the 2007 Kentucky-Tennessee Water Environment Association Annual Conference as speakers. The pair also traveled on two separate training programs to Brazil to present about industrial wastewater treatment systems. Photo courtesy of Goodman. master-level industrial wastewater operator in Indiana. Goodman encourages others in the water sector to get involved with professional organizations such as WEF because there are many different opportunities out there. No matter your interest in water, WEF has an avenue for you to explore, he said.